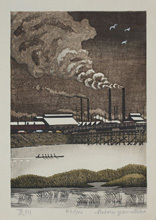 Fukushima was born in 1920 in the Island of Enoshima in Kanagawa Prefecture. 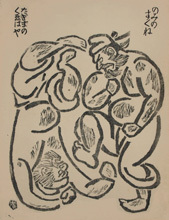 From1937 on he learned art under Ota Koji, who introduced him to Azechi Umetaro. 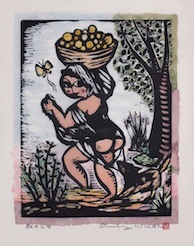 Azechi"s works totally inspired him to open the door to the world of hanga. us a poetic impression with some lonesome atmosphere. artist and a guitarist playing Spanish music. 1933 Born in Tochigi Prefecture. 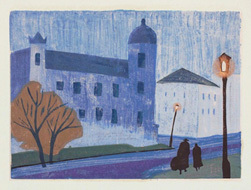 1957 graduated from Tokyo Art College as a design major. Seibu Department Store, Isuzu Automobile, and IBM. 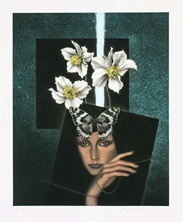 1983 signed a contract with Franconi, a print publisher in Paris. 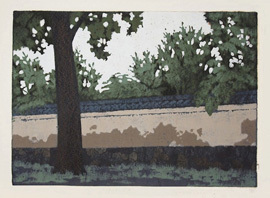 Japan Creative Print Association, Japan Watercolor Society, Shunyokai Group. 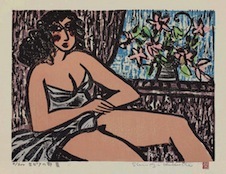 After World War II,.hhe taught at Tokyo University of the Arts. 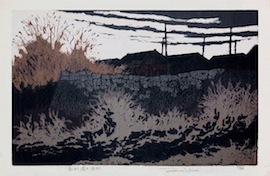 Born in Tokyo in 1926, he graduated from Meiji University in 1945.
company, he started to learn woodblock printing by himself around 1962. 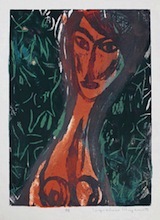 In 1978 he left the company and devoted himself to making prints. 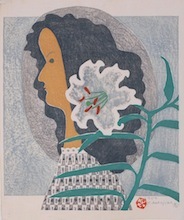 Sensibility; The Worlds of Kawakami Sumio and Yamataka Noboru"
He also left many book-cover designs. of trees ans woods and.stars and constellations. 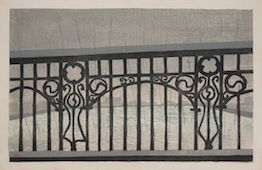 world, Kishida Kokushi and Ozu Yasujiro higly valued him for his refined silvery manners. 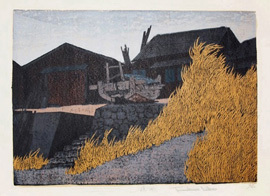 He was a member of Japan Print Association between 1954 and 1973.
with the world of black and white woodblock prints. 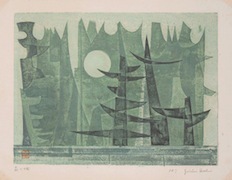 always admired Munakata's works for their feeling of incredible liberty. 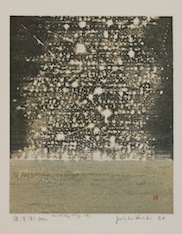 his oil painting was exhibited at a Kofukai Exhibition. 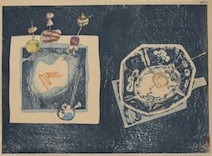 Nishida Takeo and Kon Junzo, made efforts to spread this new medium. 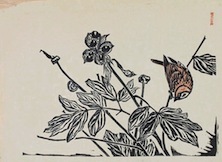 1960 He joined Japan Hanga Association. 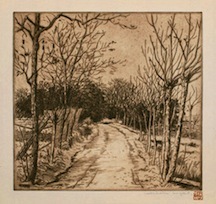 Japan Hanga Association until 1962.
aftterwards exhibited his works mainly in solo exhibitions.